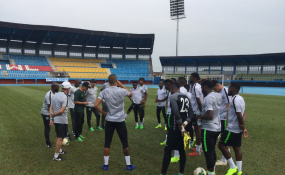 Stand -in Captain, Ahmed Musa and 21 other players trained at the Stephen Keshi Stadium, Asaba, yesterday evening as the Super Eagles stepped into gear for Saturday's 2019 Africa Cup of Nations qualifying battle against the Bafana Bafana of South Africa in Johannesburg. At training as well were goalkeepers Daniel Akpeyi, Theophilus Afelokhai and Ikechukwu Ezenwa, and defenders Olaoluwa Aina, Adeleye Aniyikaye, Semi Ajayi, Bryan Idowu, William Ekong, Leon Balogun, Kenneth Omeruo and Jamilu Collins. Only France -based forward, Samuel Kalu is expected on today. Table -toppers Nigeria actually need just one point from Saturday's encounter inside the FNB Stadium in Soweto, outside Johannesburg, to be sure of a slot at next year's continental house party, but a combination of national pride, assumed rivalry between both teams and commitment to avenging a stinging defeat by the Bafana Bafana in Uyo 17 months ago has adorned this match with a totally different garb. On Matchday 1 of the qualifying series, South Africa won 2-0 with goals from Tokelo Rantie and Percy Tau right inside the Godswill Akpabio Stadium, as Coach Gernot Rohr sent out a young, inexperienced Nigerian squad. However, that slap (the first ever loss to South Africa in a competitive match) stirred the formidable spirit in the Eagles and they swept all before them to earn a 2018 FIFA World Cup ticket with a match to spare. However, the memory of that defeat has not gone away, which was why the Eagles have pulled no punches since the 2019 AFCON qualifiers resumed in September, winning all three matches to bounce to the top of the pool and standing at the door of qualification with a match to spare. The Nigeria delegation to Saturday's big match will depart the country aboard a chartered flight from the Benin City Airport on Thursday evening. The Eagles are expected to have a feel of the picturesque FNB Stadium on Friday afternoon by 3.30pm.